The digital divide looks like Buffalo’s Broadway Market on a Friday afternoon: a dozen round tables thronged with lunchgoers – and nary a laptop or tablet among them. Most households in this neighborhood don’t own such devices, new first-of-its-kind federal data show. And even fewer have the means to go online with them, either at the Broadway Market or in their own homes. The data, released by the Census Bureau last month, expose for the first time the true depths of the digital gap in the region: While 80 percent of households in Erie and Niagara counties are online, low-income pockets of Buffalo, Lockport and Niagara Falls have fallen off the grid. The disparities are starkest on Buffalo’s East Side, particularly in the Broadway-Fillmore district, where fewer than two in five homes have internet on some blocks. The new numbers come at a time of mounting alarm among city and school officials, who have called for more aggressive policy action to address disparities they say could deepen poverty in the region. Local advocates blame the cost of a basic internet package for the persistence of the region’s digital gap. 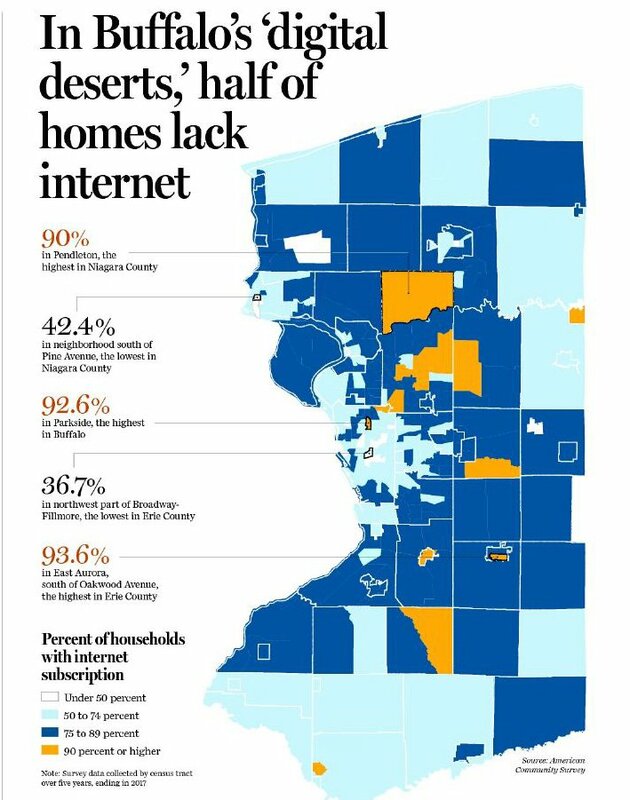 While Erie and Niagara County’s connectivity rates only slightly lag both national averages, Western New York is pockmarked with deeper “digital deserts” – largely urban, low-income neighborhoods where more than half of all households do not have home internet or cellular data plans, despite being wired for them. Those neighborhoods include stretches of Little Italy in Niagara Falls, most of downtown Lockport, and the East and Lower West Sides of Buffalo, where between 37 and 71 percent of households have internet service. By comparison, 88 percent of Orchard Park households are online, as are 87 percent in Amherst. Families in the suburbs and in Buffalo’s wealthier neighborhoods also frequently have access to faster internet speeds and a wider variety of internet providers, according to a Buffalo News review of Federal Communications Commission records. In many city neighborhoods, residents have only three non-satellite options: Spectrum, which charges $64.99 for its most basic package; BarrierFree, which charges $100 for specialized high-speed internet; and Verizon, which offers a limited DSL connection – too slow to stream video or do schoolwork, under FCC speed guidelines – for $29.99. Some low-income families may also qualify for new at-cost packages, such as Spectrum Internet Assist, which offers basic service to low-income seniors and families with school-age children for $14.99 per month. But even that lies out of reach for many, said Anibal Soler, the head of the Office of Strategic Alignment and Innovation at Buffalo Public Schools. Home broadband is critical to student success, the Buffalo Public Schools say. Instruction has migrated online, and students need an internet connection to complete research assignments, read ebooks and access classroom forums and credit-recovery courses. Meanwhile, offline parents often struggle to track their child’s schedule and school progress – to say nothing of applying for jobs, looking up bus routes or researching medical symptoms. Smartphones don’t cut it for these tasks, experts say. Neither do public terminals at places like libraries, because they run on restricted schedules. To be clear, policymakers have taken actions to address the digital divide in the past – from a national program that subsidizes low-income households’ smartphone bills to a $500 million state broadband infrastructure project. But while these efforts have connected more homes to the grid and made data plans more affordable, they apparently haven’t brought costs down enough for many families, said Debabrata Talukdar, a University at Buffalo professor who studies inequities in internet access. That has spurred some city technologists to begin pushing for free, public Wi-Fi, similar to ongoing programs in New York City, Albany and Columbus. Taveras said fiber companies that do business with the city will soon need to install public hotspots as part of their contracts. Mayor Byron Brown is expected to announce more details during his State of the City address in February. Separately, Buffalo Public Schools are exploring a program that would use federal education funds to offer free home internet to BPS students and their families living near some high-poverty schools. The city also launched a free Wi-Fi corridor along Jefferson Avenue in October, joining an existing free Wi-Fi zone along Main Street downtown. Partnerships with private companies paid for both initiatives. But some neighborhoods have already fallen behind while policymakers debate the details, said Donna Latham-Edwards, a longtime Broadway-Fillmore resident and community organizer. A deeply impoverished neighborhood, rusted and hollowed by decades of white flight and disinvestment, Broadway-Fillmore boasts three budget phone shops in its low-slung strip malls – though only 36.7 percent of the households just north of Broadway say they have home internet or cellular data service. The numbers concern Latham-Edwards, who has asked the city to install Wi-Fi at the Broadway Market or to keep local school buildings open later. Since the neighborhood library closed in 2005, the closest public Wi-Fi hotspot is the Central Library downtown, which closes at 6 p.m. most nights and costs $4 in round-trip bus fare. How can students do their homework, she asked. How do their parents check their grades or know what’s going on in school?